Here is my tag that i created with rubber stamp from Sweet Pea stamps by Elaine Cox "Miranda". i stamped image with embossing ink and used gold embossing powder. I used distress ink for the image also. Here is some embellishments. Butterfly i made of polymer clay. Sweet Pea Stamps DT Project. Good day everyone. 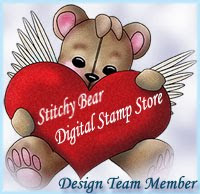 With a very heavy heart, i must say that this will be my last post for now as a DT with Sweet Pea Stamps. I need time for my self to find crafting mogo. But i am totally sure that you will see my coloring. This week our showcase Artist are Karen Middleton, and this awesome digital image call Biker Boy. Image i colored with Spectrum Noir markers. also i used here doily die and banners dies. Good day everyone. Here is another project that i made for Sweet Pea Stamps. This time i decided to play with my heat press and vinyl. This gorgeous Zentangle Elephant image by Courtney McAnsh. As i like everything to be sparkle, i used black glitter vinyl. It was lots of work to weed it out, but i like the way it's turnout . And this is how i decorated Shirt on the front. Welcome to another inspirational blog post with Sweet Pea Stamps. For today's card i used gorgeous image by Teresa Sherman "Katarina". You can find this digi HERE. Image colored with distress ink and placed on digital background. Here is some pretty flower that i made. Every Friday i showcase Sweet Pea Stamps projects, and today one of those awesome days! For my card i used gorgeous rubber stamp that i own for a long time "Lady Bug" by Joanne Schempp. You can find this image in rubber or digi, and that is a beauty about it. I used punches to make my flowers and die cuts to create my card. I hope you like it. Very Fairy day to all. Hello everyone. I love Fridays because i can share with you my DT project at Sweet Pea Stamps. I have a card with lovely image by our new Artist Ronne P Barton "Gothic cuties Dragon Fairy". She looks like such a playful fairy, and what a cute Dragon friend? Here is close up look on the image. Good day my Friends. Here is another card that i made for Sweet Pea Stamps. As you may know it's week of the Artist - Joanne Schempp. time from time i like to make cards for a Man, so this Pirate image just prefect for that. Image call "Ancient One". He is gorgeous, isn't it? Everything is distressed with ink. Here is awesome card that i made as a DT project at OSAAT, by using amazing digital stamps "Musical Notes" by Sentimental Susan. what is awesome about this card? It's because i made it for my baby Girl Katharine. Her dREAM is to go one day to Paris . No kidding! Even i don't have a dreams like that lol, and she is only 6 years old. Bless her Heart! As you see it's very sparkle, just to way i like it. I printed digi notes and inked them with distress inks. after that i wet embossed with clear embossing powder and added glitter on the top wile it's still wet and embossed one more time from under the paper, so glitter don't fly away. Around the border i used MS punch, Die cut tower , added lots gems and lace. Butterflies are digital images that i printed out and cut out. This is it for today. See you next time. Good day everyone. Here is another inspiration for you with Sweet Pea Stamps. This cute little Bear by Conie Fong call "Bella Sending You Smiles". She was colored little bit with ink, some markers and pencils. To decorate i use doily die by Cheery Lyne and pretty gems flowers with pearls, that i got from Dollar store. Thanks for looking, and don't forget to stop by at the shop to see new product. No craft projects for today, but i have YUMMY one lol. In my mane Pot i add water, just to cover my Ribs. This is what give you very good flavor. When Ribs starting to boil, it's good to take out all that white build up. wile ribs still boiling, i starting to get all my ingredients; potato, cabbage, carrots, onions. when Ribs half way done, add diced Potatos. Then i fry onions and carrots on vegetable oil. Aha! It's time to get really messy! The Bets! I cut them in a long strips. Just the way my Mom did. Then i fry my Bets together with Onions and Carrots. After Potato half way done, add Cabbage to the pot. Then all that goodness that you just fry. It's looks something like this. Then more Bets you add, then more Red your Botsch will be. Now it's time to add more water to your pot. lets add some spices; black pepper, salt, parsley, chives or green onions, bay leaves. Cover you pot and lets simmer on very low heat. Oh look at that colors! I like mine with Sour Cream, so i add table spoon of it. I told you i like photos, and if you still here, you must be very hungry by now lol. You can comment if you have any questions. Good Morning all. For today inspiration at Sweet Pea Stamps i decided to work with this gorgeous image by Gabriela Szabo "Aphrodite". You can find this talented Artist at our SPS Website . Have a grate day all. It's time for our new challenge at http://onestitchatatimechallenge.blogspot.ca/. We like to see Ester creations. For my DT sample i used "My Pet Easter bunny" digital papers and colored image by RSP. Winner will receive this wonderful prize pack of digis. Happy Friday everyone. It is time for another week inspiration at Sweet Pea Stamps Blog. I decided to go with Mitzi Sato-Wiuff's rubber stamp "Poppy Elf". Isn't she absolutely gorgeous? I had so much fun to color her. I started with water color pencils, than added shading with"Silks" - shimmer semi-gloss acrylic glaze. It's so sparkle and beautiful, that photo will never show true beauty.